Natural lithography; atomic beams; 3D AFM. For years, researchers have been exploring the development of nanosphere lithography or natural lithography. 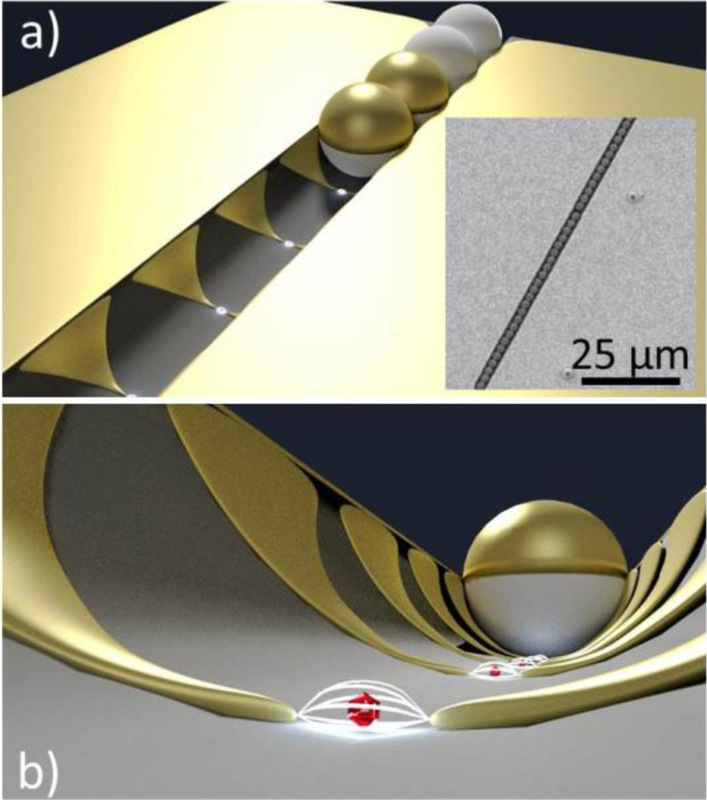 Nanosphere lithography makes use of directed self-assembly (DSA) techniques. The process begins with self-assembly of a nanosphere mask onto a substrate. This is followed by deposition of a material through the mask. The University of Paderborn has put a new twist in nanosphere lithography. Researchers from the university have been exploring selective deposition and self-assembly of nanospheres from a colloidal suspension in trenches on silicon surfaces. Researchers used a “doctor-blade-based” technique to enable the self-assembly process on a pre-patterned surface. This technique is used in combination with a functionalized surface, where a self-assembled molecular monolayer changes the contact angle, according to researchers. Trenches with widths from one to several nanospheres in diameter were formed using photolithography and reactive ion etching. Lines selectively filled with a chain of beads with a length of 0.5mm were achieved. In the process, researchers demonstrated an array of nanocrystalline nickel dots on silicon after removing the mask. They also demonstrated zinc oxide nanoparticles and nanowires arranged in an array. All told, a network of silver-coated organic nanowires were devised using a mask of polystyrene beads. “Future work will deal with exploiting such linearly arranged field concentrators, with further improvements of large-area 2D NSL masks, and with the in-depth characterization of selected plasmonic and catalytic nanoparticle systems,” said Jörg K. N. Lindner, a professor of physics at the University of Paderborn, on the SPIE Web site. The National Institute of Standards and Technology (NIST) has developed a new ion source, based on a laser-cooled atomic beam technology. The technology could enable a new class of focused ion beam tools, which would have a higher brightness and better resolution than current systems. Applications include semiconductors and biotechnology. Schematic of the LoTIS ion source. 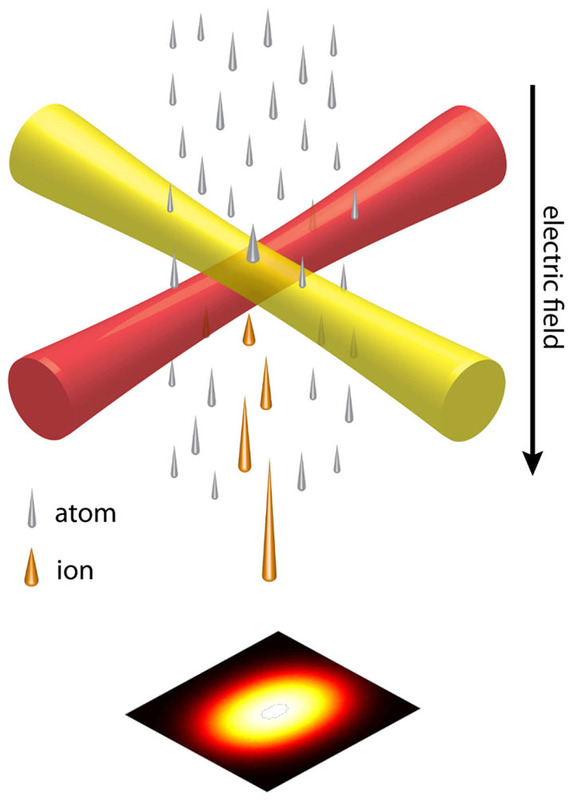 A compressed and laser-cooled atom beam is ionized by crossed laser beams. The resulting ion beam has the requisite brightness for creating a focal spot less than a nanometer in diameter with currents in the picoampere range. Source: NIST. When combined with a conventional ion focusing column, the laser-cooled atomic beam technology could enable a 1pA beam into a spot smaller than 1nm. A total current greater than 5nA was measured in a lower-brightness configuration of the ion source. Researchers have also constructed a prototype of a low-temperature ion source. The system begins by generating an atomic beam using a 2D magneto-optical trap. The beam of atoms is then compressed. Then, the beam is further cooled to below 30µK using counter-propagating polarized laser beams. The atom beam then enters an ionizing laser beam. Researchers predict that cesium beams created with the prototype tool will have focal spot sizes of less than a nanometer. This will go well beyond the capabilities of the gallium liquid metal ion sources commonly used in the industry today. Atomic force microscopes (AFMs) are used in metrology and related applications as a means of measuring 2D structures. But the ability to look at 3D structures using AFMs has been elusive. In conventional AFMs, the tip interaction force vector is not accessible for use in 3D measurements. The University of Missouri-Columbia, however, has obtained 3D measurements using AFMs. To accomplish this feat, researchers have developed a so-called ultra-stable AFM technology. In this technology, researchers scatter a focused laser directly off an AFM tip apex to measure the tapping tip trajectory. This, in turn, derives 3D information. All told, measurements of tip acceleration in 3D allowed determination of the interaction force by applying Newton’s second law of motion, according to researchers. This data also yields cantilever spring constants and effective masses in 3D. Lateral forces representing 49% and 13% of the normal force (Fz = 152 ± 17 pN) were observed in common tapping mode, according to researchers. When addressing the surface of a lipid bilayer, the behavior of the force components differed from that observed on glass. This is attributed to the lateral mobility of the lipid membrane coupled with its elastic properties.